A FortiGate unit with two interfaces connected to the Internet can be configured to support redundant VPNs to the same remote peer. If the primary connection fails, the FortiGate unit can establish a VPN using the other connection. Redundant tunnels do not support Tunnel Mode or manual keys. You must use Interface Mode. A fully-redundant configuration requires redundant connections to the Internet on both peers. The figure below shows an example of this. This is useful to create a reliable connection between two FortiGate units with static IP addresses. When only one peer has redundant connections, the configuration is partially-redundant. For an example of this, see Configuration overview. This is useful to provide reliable service from a FortiGate unit with static IP addresses that accepts connections from dialup IPsec VPN clients. In a fully-redundant VPN configuration with two interfaces on each peer, four distinct paths are possible for VPN traffic from end to end. Each interface on a peer can communicate with both interfaces on the other peer. This ensures that a VPN will be available as long as each peer has one working connection to the Internet. You configure a VPN and an entry in the routing table for each of the four paths. All of these VPNs are ready to carry data. You set different routing distances for each route and only the shortest distance route is used. If this route fails, the route with the next shortest distance is used. The redundant configurations described in this chapter use route-based VPNs, otherwise known as virtual IPsec interfaces. This means that the FortiGate unit must operate in NAT mode. You must use auto-keying. A VPN that is created using manual keys cannot be included in a redundant-tunnel configuration. The configuration described here assumes that your redundant VPNs are essentially equal in cost and capability. When the original VPN returns to service, traffic continues to use the replacement VPN until the replacement VPN fails. If your redundant VPN uses more expensive facilities, you want to use it only as a backup while the main VPN is down. For information on how to do this, see Configuration overview. A VPN that is created using manual keys cannot be included in a redundant-tunnel configuration. One Phase 1 configuration (virtual IPsec interface) for each path between the two peers. In a fully-meshed redundant configuration, each network interface on one peer can communicate with each network interface on the remote peer. If both peers have two public interfaces, this means that each peer has four paths, for example. One Phase 2 definition for each Phase 1 configuration. One static route for each IPsec interface, with different distance values to prioritize the routes. Two Accept security policies per IPsec interface, one for each direction of traffic. Dead peer detection enabled in each Phase 1 definition. The procedures in this section assume that two separate interfaces to the Internet are available on each VPN peer. 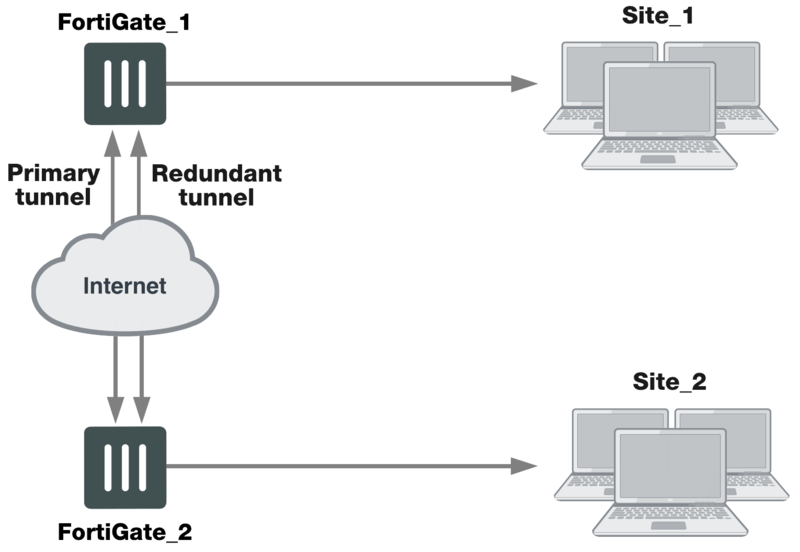 VPN peers are configured using Interface Mode for redundant tunnels. Ensure that the interfaces used in the VPN have static IP addresses. Create a Phase 1 configuration for each of the paths between the peers. Enable dead peer detection so that one of the other paths is activated if this path fails. Remote Gateway Select Static IP Address. IP Address Type the IP address of the primary interface of the remote peer. Local Interface Select the primary public interface of this peer. IP Address Type the IP address of the secondary interface of the remote peer. Local Interface Select the secondary public interface of this peer. For more information, see Phase 1 parameters. Create a Phase 2 definition for each path. See Phase 2 parameters. Select the Phase 1 configuration (virtual IPsec interface) that you defined for this path. You can select the name from the Static IP Address part of the list. Create a route for each path to the other peer. If there are two ports on each peer, there are four possible paths between the peer devices. Destination IP/Mask The IP address and netmask of the private network behind the remote peer. Device One of the virtual IPsec interfaces on the local peer. Distance For each path, enter a different value to prioritize the paths. Incoming Interface Select the local interface to the internal (private) network. Outgoing Interface Select one of the virtual IPsec interfaces you created in Step 2. Incoming Interface Select one of the virtual IPsec interfaces you created in Step 2. Outgoing Interface Select the local interface to the internal (private) network. Place the policy in the policy list above any other policies having similar source and destination addresses. Repeat this procedure at the remote FortiGate unit. You can configure a route-based VPN that acts as a backup facility to another VPN. It is used only while your main VPN is out of service. This is desirable when the redundant VPN uses a more expensive facility. You can configure a backup IPsec interface only in the CLI. The backup feature works only on interfaces with static addresses that have dead peer detection enabled. The monitor option creates a backup VPN for the specified Phase 1 configuration. In the following example, backup_vpn is a backup for main_vpn.